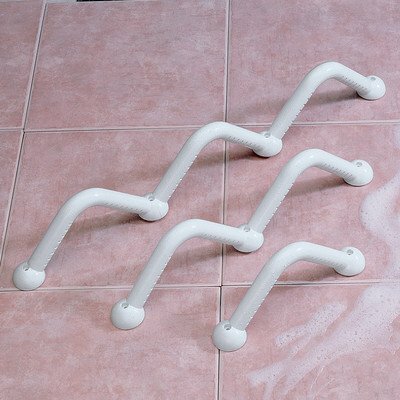 Ergonomically designed grip bar provides support and security in the bathroom while using the toilet, bathing, or showering. One or more bars can be installed vertically on bathtub walls or in shower stalls. Can also be installed vertically near toilets and commodes to aid in getting on and off a toilet seat. The plastic grips have grooved inner surfaces for a safe, non-slip grasp. Suitable for home, institutional, or hotel use. Includes hardware and instructions for installation. Wall clearance is 3" (7.6 cm) and rod diameter is 3/4" (1.9 cm).